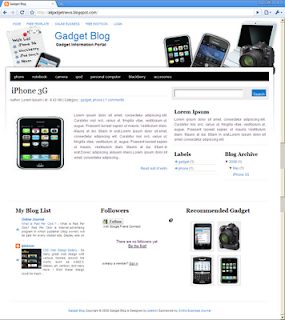 Introducing my new blogger template, Gadget Blog Template. As its name, this template suitable for gadget and technology blog, discussing about phone, ipod, notebook, and another gadget. Download xml file from link download, save it (Remember, save do not open). Then Open Edit HTML, upload xml file that have been downloaded. Change red color text to your link, and blue color text to your own anchor text menu. Open Edit HTML. Tick on Expand Widget Template. Find and edit these code below. Red color text change to your image URL. apa uda bagus apa blum ? trus gmna?? dikuranginkah ijonya ?? Thanks for the helpful information. Hope to hear more from you. Wah .. theme yg satu ini luar biasa cakep ..donlot dulu ah ..
hi cebong, can we change the header pics. i just like the it. how to hide or remove the search bar? The image is not centralizated! Now, can you tell my why are my fonts, on the nav bar, strange? And how can i change them back? One more thing, you know that scrolling bar on the "ps3" icon? how can I put one more of those, at my "xbox 360" icon? But I can´t remove my underline! Another thing, where do i put that "font family" thing? open edit HTML, tick mark on expand widget template, search for thats "Read rest of entry"
thanks om admin templatenya ... ijin unduh ya ..
@sendy : sudah diparse belum kode nya? terus mbak bagaimana caranya hilangin thumbnailnya? Hi! The template is wonderful and i think that I will use it for my blog, but I have a question for you. I don't manage to see the date of post...Is there a solution? Sorry for my english. I hope you answer me. Goodbye! Thanks a lot for your work! You are great! Thanks a lot and sorry again for my english! @rjs mama: create image size, 940 pixel..
i already fixed the header problem. thanks. but i have another question, the adsense ads are not showing up on the sidebar, how can i fix this problem? why is the follow blog button missing on my navbar? I really would like to use this template, but I use smaller/oddly shaped images on my blog that get distorted in preview on the main page. Is there any way to fix this? img_width:200 , or similar like that.. Thank you so much for the help, Cebong! Hi... I am using my template in ma blog http://telecomnewz.blogspot.com/ .. Is der any option to show full post on homepage..? coz if i submit my blog for ad services , they r replyin that the posts are truncated and not visible fully.. plz help me..
Hi... I am using this template in ma blog http://telecomnewz.blogspot.com/ .. Is der any option to show full post on homepage..? coz if i submit my blog for ad services , they r replyin that the posts are truncated and not visible fully.. plz help me..
One more question. Is there a way to add the date to each post? Hi... I did the reverse process.. But i am getting error message lik this..
What should i do now? need assistance..
saya pengen merubah label jdi cloud ko g bisa y? <Previus Home And Next No work good Why? I quite like this template and use it in my blog. I have a problem and it only shows me the last 4 entries or if a search for a tag, it only shows 4 results (entries). Hi Buddy your Design is quite perfect . welldone!! but i find it is lack of Distribution icons .can i add some icons on footer region only for Distribution purpose??? ?Distribution icons ICons like Facebook,Twitter,yahoo,gmail,Stumbleupon,.....etc please reply soon. This is a great template. However, I was wondering if there was any way to reply to comments. Visitors to my blog can post comments but they cannot reply to one. I would also like to know if there is any way to let visitors subscribe to comments. I forgot to sign in so here is my repost. I would also like to know if there is any way to let visitors subscribe to their comments. I think that this one. It is even better that the one before this one. People really like to have gadgets. Different and hell lot of them. Gad gets bog so nice and more interesting blog that can be more entertainment and enjoy it in this post so nice.